Nathan Chen landed five quadruple (quad) jumps, including two in combination, en route to winning his second consecutive gold medal at the U.S. Championships in San Jose, California on Saturday night. Chen won both the short program and the free skate in convincing fashion, finishing with a total score of 315.23. The score was three points lower than his total score of 318.47 at the 2017 U.S. Championships in Kansas City, still the highest-ever total score in the men’s event. Chen is expected to be named to the Olympic team and is considered a favorite for the gold medal in PyeongChang, South Korea. The surprise of the evening was the performance of Ross Miner, who was in sixth place after the short program. The 26-year-old performed his best free skate of the season — and perhaps of his entire career — opening with a clean quad salchow. He proceeded to land eight triple jumps, including two triple-triple combinations — lutz/toe loop in the first half and lutz/single (half) loop/salchow in the second half — to win the silver medal with a total score of 274.51. The last time Miner medaled at the U.S. Championships was in 2013 in Omaha, Nebraska, where he also won the silver. “I had one of the most fun nights I’ve ever had on the ice. That’s what I do in training at home, so it was such a good feeling to put it out there at the big game and show what I’m capable of, and that’s what I do all the time. It was pretty special,” said Miner. 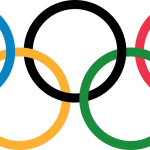 Prior to the national championships, Miner’s name had not been included in the forefront of the group of U.S. men expected to be considered for an Olympic spot. After Saturday night’s rousing performance, Miner says he deserves to be at the Olympics. “Well, I know it’s not a fluke (his free skate). That’s what I do at home every day, and this was the big moment, and I went out there and had no regrets, and I put out a clean competition and at the end of the day I did my job, and it’s up to (the selection committee) to decide what they decide,” said Miner. Finishing behind Miner and winning the bronze medal was 2017 U.S. silver medalist and reigning World Junior Champion Vincent Zhou, who delivered a strong performance in front of his hometown crowd, which included dozens of family and friends wearing “Go Vincent” red t-shirts. The 17-year-old attempted five quads in his free skate, but three received under-rotation calls from the technical panel and his quad toe loop was downgraded. He earned a total score of 273.83. “I love what I do, and what I do is this thing called figure skating, not sure if you’ve heard of it before. Tonight was pretty special, the crowd was awesome, and the energy was flowing through my veins, if that’s even possible, and I know I made a few mistakes, but overall I’m proud of myself for fighting all the way through tonight,” said Zhou. 2016 U.S. Champion Adam Rippon and 2015 U.S. Champion Jason Brown, both of whom were among the men considered likely to be on the podium and the Olympic team, struggled in their respective free skates. Rippon fell on his opening quad lutz, and landed both of his triple axels in the second half of his program before unexpectedly singling both a planned triple salchow and triple lutz. He finished in fourth place with an overall score of 268.34. Brown, who skated after Rippon, fell on his opening quad toe loop which was downgraded to a triple, received two under-rotation calls on his first triple axel and triple loop, and twice singled toe loops at the end of planned triple-triple combinations in the second half of his program. He finished in sixth place, behind Grant Hochstein‘s 255.31 in fifth, with an overall score of 253.68. Both Rippon and Brown will have wait and see if the selection committee will name them to the Olympic team, or as alternates, based on the qualifying criteria. “I knew that there was a criteria set to be selected for the Olympic team, and I feel like I have better criteria than second and third place here. But that being said, Vincent and Ross skated well tonight, and no matter what the selection is I will be 100 percent okay and can handle that,” said Rippon regarding the Olympic team selection. UPDATE: On Sunday morning, approximately 15 hours after the men’s free skate had concluded, U.S. Figure Skating announced that Nathan Chen, Adam Rippon and Vincent Zhou had been nominated to represent Team USA at the 2018 Olympic Winter Games, February 9-25, in PyeongChang, South Korea. 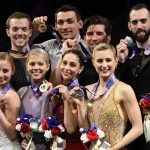 The three were also assigned to represent Team USA at the ISU World Figure Skating Championships, March 19-25, in Milan, Italy. U.S. Figure Skating President Sam Auxier said Nathan Chen was the only one to have high marks in all three tiers, winning the 2018 U.S. Championships and 2017 Grand Prix Final, plus his sixth place finish at 2017 Worlds (Tier 1); two gold medals in the Grand Prix Series this past fall and gold at the 2017 Four Continents Championships (Tier 2); and winning both the 2017 U.S. International Classic (a Challenger Series event) and 2017 U.S. Championships (Tier 3). Auxier asserted that Rippon had one of the strongest seasons of all the U.S. men. Despite a fourth place finish at the 2018 U.S. Championships, Rippon was 5th at the Grand Prix Final (Tier 1), won two silver medals in the Grand Prix Series (Tier 2), and finished third at his Challenger Series event, Finlandia Trophy (Tier 3). Miner, in contrast, though winning the silver medal at the 2018 U.S. Championships (Tier 1), has never competed at a a Grand Prix Final (Rippon has qualified for the past two Finals), and the last World Championships in which Miner has competed in was 2013. Miner finished sixth at his only 2017 Grand Prix assignment, Skate America (Rippon was 2nd), and was not assigned to compete at the 2017 Four Continents Championships. Miner also finished in 5th at 2017 Finlandia Trophy (behind both Zhou in 2nd and Rippon in 3rd), and 6th at 2017 Autumn Classic, both Challenger Series events (Tier 3). Instead, Miner will compete at the 2018 Four Continents Championships in Taipei City, Taiwan, later this month, and was named second alternate for the Olympic and World Teams, with Brown being named the first alternate to both. 2017 ISU Junior Grand Prix Final champion Alex Krasnozhon, who placed tenth in his senior national debut in San Jose, along with new U.S. Junior champion and ISU Junior Grand Prix Final silver medalist Camden Pulkinen, and Tomoki Hiwatashi, will represent Team USA at the upcoming World Junior Championships, March 5-11, 2018, in Sofia, Bulgaria.